Emerging market currencies have soared over the last few months, thanks to a commensurate recovery in investor risk appetite. This trend is on full display in Eastern Europe, where, “The Hungarian currency, which has dropped 14 percent in the past year, has been the best performer in the past three months of the 26 emerging-market units tracked Bloomberg, having advanced 10 percent.” The Polish Zloty, meanwhile, can claim the distinction of best performer against the Euro, having risen 6% in the last month alone. 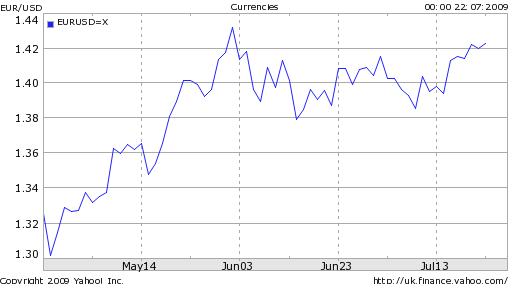 [The chart below, which plots both currencies against the USD, is inverted]. Speaking of Hungary, it is projected for “Gross domestic product to drop 6.7 percent this year, the most since 1991. Hungary, along with other emerging economies across Europe, has been hurt by a collapse in demand for its exports including Nokia phones and Audi cars. ‘The Hungarian economy is unlikely to recover from the current recession much before 2011.” The Central Bank recently moved to cut interest rates by a whopping 1%, and may cut rates by a further 2.5% before the year is out. Investors, evidently, are indifferent to this prospect, and continue to push Hungarian stocks, bonds, and currency back towards the levels of the bubble years. This disconnect between economic fundamentals and asset prices seems to be playing out throughout the EU. On one front, “Bulgaria and the Baltic states of Latvia, Estonia and Lithuania, also EU members, have had to resist pressure to devalue their currencies as eastern Europe’s recession takes its toll.” According to another source, “Nonperforming loans are rising across the EBRD countries and have doubled in the past year in Turkey, Romania, Ukraine and Albania, according to the EBRD. Recent data from national central banks show commercial banks in Romania are no longer collecting interest on more than 8% of the loans they’ve extended, and the figure is nearing 5% in Turkey, where credit cards are already defaulting at a double-digit pace.” At the same time, the Dow Jones Eastern Europe Stock Index just touched a 10-month high. Go figure. 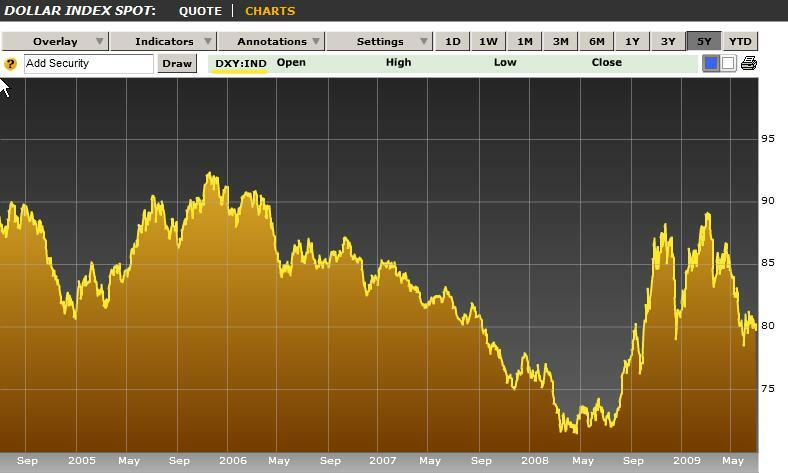 In the same vein as Monday’s and Tuesday’s posts (covering the New Zealand Dollar and Australian Dollar, respectively), I’d like to use today’s post to look at another commodity currency – the Canadian Dollar. The Loonie, it turns out, has also benefited from the a recovery in risk appetite and concomitant boom in commodity prices; it has appreciated by 7% against the USD in the last month alone, en route to a ten-month high. “All in all, with almost everything going its way these days (besides the crummy weather and the impact on tourism), a return trip to parity – last visited nearly one year ago – doesn’t seem far fetched,” chimes one optimistic analyst. Like Australia and New Zealand, Canada’s economic fate is tied closely to commodity prices. Simply, as oil and other natural resources have inched closer to last year’s record highs, the Loonie has rebounded proportionately. “Raw materials account for more than 50 percent of Canada’s export revenue. Crude is the nation’s largest export.” Of course, this relationship works both ways. Any indication that the global economic recovery is stalling, and commodities prices would likely tumble, bringing commodity currencies down likewise. Unlike the Australian Dollar and New Zealand Dollar, the Loonie has never really held much appeal as a carry trade currency. 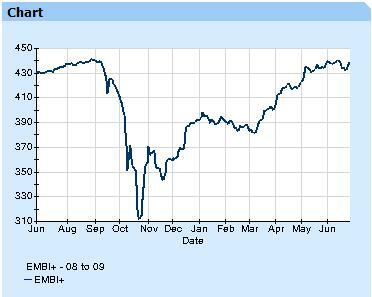 Even at their peak, Canadian interest rates were mediocre, from the standpoint of yield. The current rate is a measly .25%, compared to 2.5% in New Zealand and 3% in Australia. Moreover, while Australia may begin tightening as soon as the fall, “The Bank of Canada committed to keep its key policy rate at the lowest possible level until the spring of 2010,” after voting to hold rates at yesterday’s rate setting meeting. This interest differential could explain why the Aussie has outpaced the Loonie of late. Another key difference – and potential explanation for the currencies’ recent divergence – is that Australia is considered part of the Asian economic zone, while Canada’s economic fortunes are closely aligned with those of its main trading partner, the US. 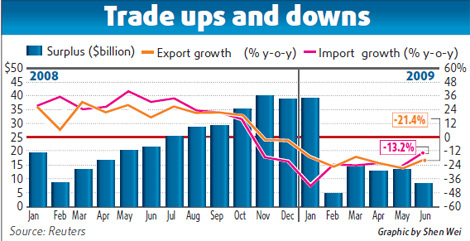 China, alone, is helping to lift Australia out of recession. The US, meanwhile, is still struggling to find its feet. Hence, it is projected that Canadian GDP will contract by 2.3% in 2009, while Australian GDP may fall by a modest .5%. “When things look bad, you are more likely to sell Canada than the Australian dollar because its economy is moderated by Asian growth,” explains one analyst. 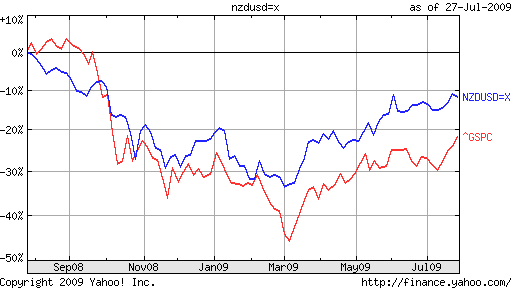 Based on the chart below, which plots the Australian Dollar against the New Zealand Dollar over the last two years, one might be tempted to conclude that the two currencies are identical for all intents and purposes. Rather than suffer the inconvenience of separately analyzing the Australian Dollar, why not just read yesterday’s post on the New Zealand Dollar, and leave it at that? But this chart belies the fact that while the two currencies, have risen and fallen (in near lockstep) in sync with the ebb and flow of risk aversion, this could soon change. While the near-term prospects for the New Zealand economy are dubious, sentiment towards the Australian economy is more consistently optimistic. “Central bank Governor Glenn Stevens said the nation’s economic downturn may not be ‘one of the more serious’ of the post-World War II era.” In addition, “Stevens said the nation’s economy may rebound faster than the central bank had predicted six months ago on improving confidence among consumers and businesses alike.” The latest projections are for a fall in .5% contraction in GDP in 2009 followed by a 1% rise in 2010. Meanwhile, government spending is surging: “The Australian government forecast its largest budget deficit on record of A$57.6 billion for fiscal year 2009-10, or 4.9% of GDP.” Combined with the steady recovery in commodity prices and the resumption of residential construction, this could soon trickle down through the Australian economy in the form of inflation. It’s no wonder, then, that the Reserve Bank of Australia (RBA) could begin tightening interest rates as early as December, in order to mitigate against the possibility of inflation in 2011 and 2012. In fact, Governor Glen Stevens has been raising eyebrows with his unequivocal comments about raising rates. “I’ve never seen written down … I’ve never heard in discussion in the institution, some rule of thumb that says we wait until unemployment’s peaked before we lift the cash rate…I think it depends what else is happening, and also depends how low you went. We eased very aggressively,” he said recently. As a result, traders are betting that rates will be 1.13% higher one year from now than they are today. This development should be of especial interest to forex traders. 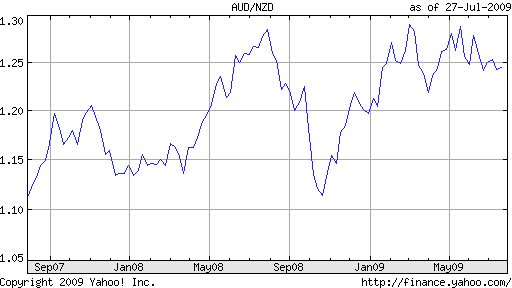 Australian interest rates are already the highest in the industrialized world. When you consider “the market’s expectations that the RBA is likely to be the G-10 central bank which is likely to hike first,” it goes a long way towards explaining the 18% rise in the Aussie that has taken place in 2009 alone. Compare a hypothetical 4% RBA benchmark rate to the .1% in Japan and ~0% in the US, and carry traders will start to salivate. 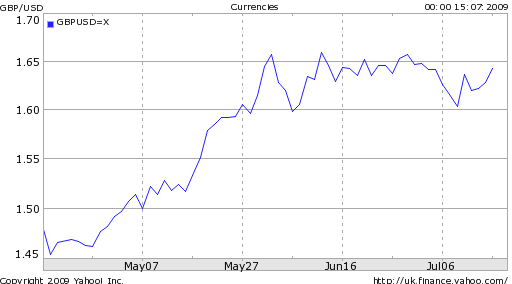 Having risen nearly 30% against the US Dollar since March, the New Zealand Dollar (NZD or Kiwi) is now close to a 9 1/2 month high. While still far from the record highs of 2008, the currency is already erased a large portion of the losses it racked up since the credit crisis gave way to economic recession. 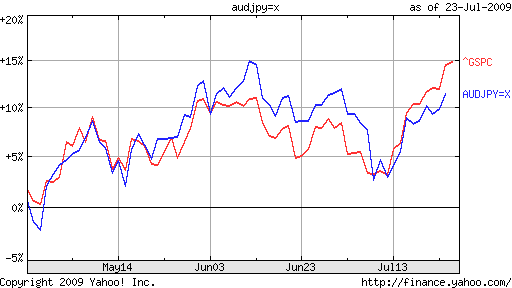 As part of last Friday’s coverage of the Japanese Yen, we included a chart which compared the performance of the AUD/JPY cross to the S&P 500. 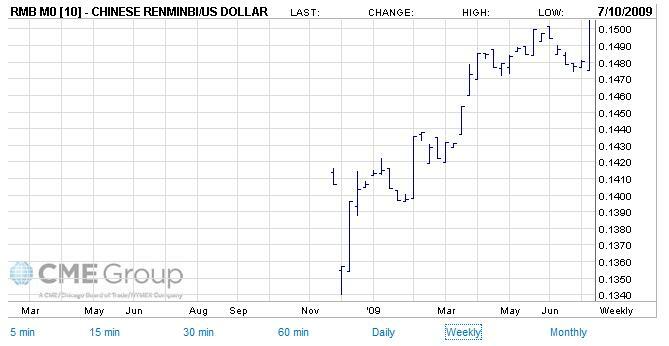 Even without calculating the correlation coefficient, a cursory review of the chart revealed an uncanny relationship! Unsurprisingly, it turns out the same relationship also applies to the New Zealand Dollar, whose recent performance closely mirrors US equities. In other words, the interplay between risk appetite and risk aversion continues to dominate the forex markets, as traders move to calibrate the split of funds between so-called safe haven currencies and the riskier alternatives, among which the New Zealand Dollar is certainly counted. Much of the rally in the Kiwi, then, represents a correction, as investors acknowledge that the near 50% slide from-peak-to-trough was an overreaction. Given the uncertain prospects for growth, combined with moderating price inflation, the RBNZ can be expected to hold interest rates at current levels for the near-term. “Bollard will leave the benchmark interest rate unchanged at a record low 2.5 percent on July 30, according to all 10 economists surveyed by Bloomberg.” Based on swap rates, the markets feel similarly, and are pricing a mere 25 basis point hike over the next twelve months. 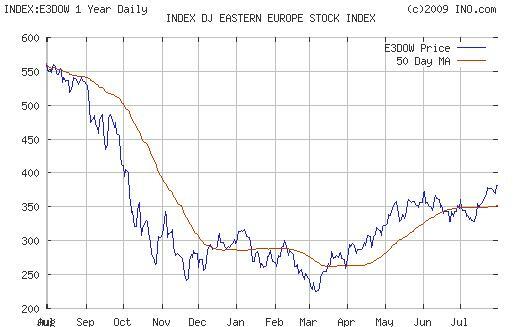 With such a dubious prognosis, one has to wonder whether the Kiwi’s rally is really sustainable. The next rate-setting meeting of the European Central Bank (“ECB”) is rapidly approaching (August 3), and analysts are stepping up to offer their opinions on the direction of EU monetary policy. At its last meeting, on July 2, the ECB voted to hold rates at the current record-low level of 1%, and all indications are that the August meeting will yield the same result. Despite getting off to a late start, the ECB has since moved adroitly to strike a balance in its monetary policy between inflation and growth. For those that insist that its rates are still too high – especially compared to the US and UK – the ECB can counter by arguing that this way it still has some scope to lower rates, if need be. “If a deflationary spiral does become entrenched, unlike most of the other major global economies, at least the European Central Bank still has some of the interest rate tool left to fall back on,” agrees one analyst. The ECB can also refer critics to its overnight lending rate, which are 75 basis points lower than its main policy rate. “Before the crisis, the ECB would aim to keep overnight interest rates close to the refi rate. 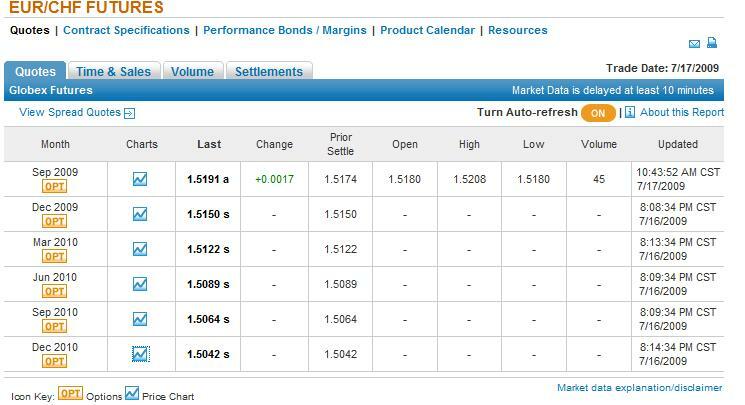 Since it moved to unlimited fixed-rate funding, the central bank has been content to allow the overnight rate to drift much lower than the policy rate.” It is at this refinancing rate that it recently lent out a record €442 billion to banks and other financial institutions. While the ECB “has had one eye on the exit since the start of the crisis,” it nonetheless appears to be in no hurry to hike rates – neither its overnight nor its refi rate. Jean-Claude Trichet himself has said, “The current rates are appropriate.” He even refused to rule out the possibility that rates could even fall further before policy is tightened. The forex markets, meanwhile, appear to be indifferent to this whole debate, concerned not about Eurozone growth, inflation, low interest rates, not to mention political uncertainties and trade deficits. The Euro has resumed its upward rise against the Dollar, begun in March, and may not slow down until the Fed starts to tighten monetary policy. These factors certainly represent a good starting point for any analysis of the Real. As signs continue to emerge that the global economy – and China specifically – have turned a corner in their fight to overcome recession, commodities will likely continue to rally, which is excellent news for Brazil bulls. In addition, “May industrial production and especially retail sales came in stronger than expected, following incipient signs of improvement in labor and credit conditions, consumer and investor confidence, and inventory levels.” As a result, after a modest contraction in 2009 (the bulk of which took place in the first quarter), 2010 is expected to mark a return to solid growth, with estimates ranging from 3.5% to 4.5%, rising to 5% in 2011. The Central Bank of Brazil, however, is not necessarily on the same page. Last week, it cut rates to a record low of 8.75%, in order to ensure that Brazilian monetary policy remains easy enough to support growth. While this is an unwelcome development for carry traders, there are a few mitigating circumstances. First, considering that Brazilian inflation is projected to average 4.5% in 2009, this still affords investors a solid 4% real return, without factoring in currency fluctuations. Second, Brazilian rates are still significantly higher than levels in industrialized countries, such that the interest rate differential which makes Brazil attractive has been carefully preserved. Finally, while precise forecasts vary, the Central Bank is expected to begin hiking rates as soon as the end of this year, with further hikes throughout 2010. The Central Bank has also been busy on other fronts. Thanks to a healthy trade surplus, its foreign exchange reserves are burgeoning, recently touching a record $209 Billion. This figure well exceeds Brazil’s outstanding debt, which gives it great flexibility in determining how to allocate these reserves. Already, the Central Bank has begun to pare down its holdings of US Treasury securities, in search of higher-yielding alternatives. 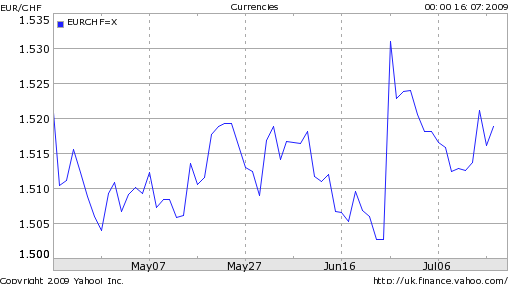 In addition, the Central Bank has taken to intervening regularly in the forex spot market, in a vain effort to stem the rise of the Real. In the short term, analysts are now lining up around various technical levels, backed by little real fundamental analysis. “Moreover, without fundamental economic news showing better times ahead for the U.S. economy, principally, then the BRL1.90 support will remain cemented in place,” offered one analyst. “You show me some more good news and the support will be closer to 1.85,” argued another. It looks like traders are just looking for excuses to keep bidding up the Real. After a brief pause, China’s foreign exchange reserves have resumed their blistering pace of growth: “The reserves rose a record $178 billion in the second quarter to $2.132 trillion, the People’s Bank of China said today on its Web site. That dwarfs a $7.7 billion gain in the previous three months.” Considering that the global economy remains embroiled in the worst recession in decades, this is frankly incredible. [Chart below courtesy of WSJ]. In short, most of the capital now flowing into China is so-called “hot money,” chasing a piece of the action in China’s surging property and stock markets. 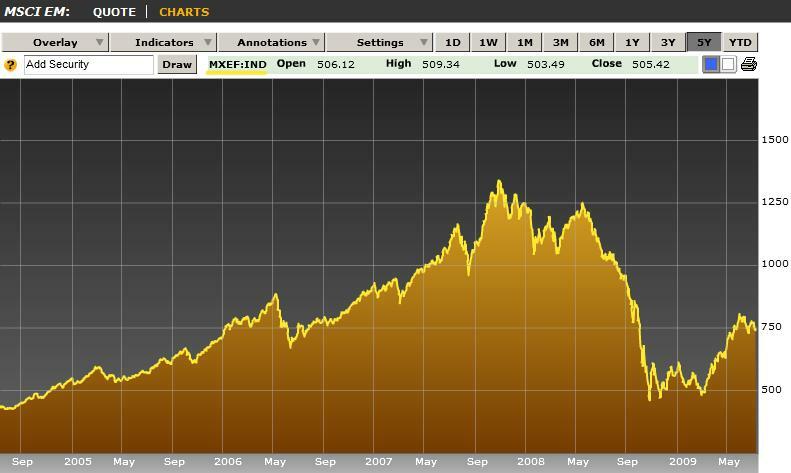 The benchmark stock index has risen 75% this year, making it the world’s best performer. In short, China is once again “caught in a squeeze similar to the one that bedevilled policymakers earlier this century, with a flood of hot money trying to force the government’s hand on the currency.” Either it allows the RMB to resume its upward path against the Dollar, or it raises interest rates rapidly to head off inflation. 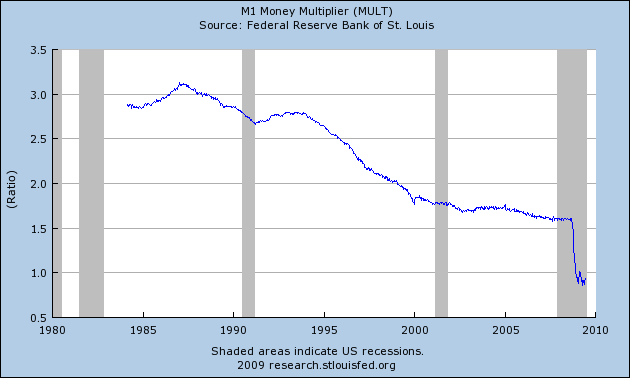 With the money supply now growing at an annualized rate of 30%+, the government is running out of time on this front. In fact, “stable” is an understatement. While other Central Banks are gradually paring their holdings of US Treasuries, China is adding to its own stockpile. Already the world’s largest holder of Treasuries, China added another $38 billion in May, for a total of $800 Billion. “On the contrary, Japan, Russia and Canada were sellers of US assets in May. Japan, the second-biggest international investor, reduced its total holdings by $8.7 billion to $677.2 billion.” Meanwhile, Zhou XiaoChuan, governor of China’s Central Bank has endorsed the current composition of reserves: “Despite the $800 billion in U.S. Treasuries, it is a diversified portfolio overall.” This certainly represents a step backwards for Mr. Zhou, who only a couple months ago was leading the charge for a global reserve currency. China did recently appoint a new official (an economist trained in the US) to manage its reserves. “The move isn’t likely to fluster foreign-exchange markets or herald any change in China’s exchange-rate policy and reform.” Still, Chinawatchers are advised to continue to monitor the situation closely for any signs of discontinuity. If an investor only read the story, Pound a Buy Before ‘Steep’ U.K. Recovery, they could be forgiven for assuming that the fundamentals underlying the Pound must be strong enough to just such a bold claim. In fact, virtually all economic indicators are trending downward, and most analysts (with the exception of the source behind the above story) are revising their Pound forecasts proportionately. While all data is subject to “spin,” all of the big picture indicators paint a consistently negative picture of the UK economy. The Organization for Economic Cooperation and Development said on June 24 that U.K. gross domestic product will shrink 4.3 percent this year, revising its March forecast for a 3.7 percent contraction. 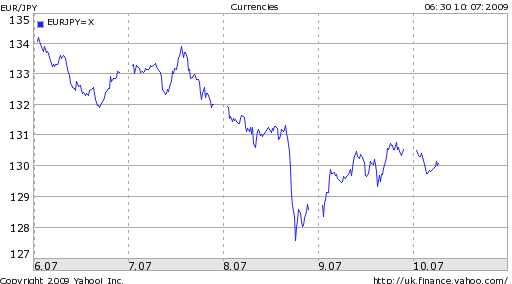 Sterling has fallen 1 percent in the past month. 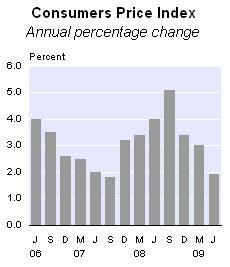 Meanwhile, unemployment is still rising (albeit at a slower pace than before), and prices are falling. The BOE will probably expand its liquidity program by the sanctioned 25 Billion Pounds, and “Speculation has also started to circulate that the Bank of England could announce it will seek approval from the Treasury to boost the size of the program even further.” Meanwhile, the government deficit is surging: “The U.K.’s credit rating is an issue that’s still there and public spending in an election year is causing concern for investors. There is a pattern in the following smattering of forex soundbites: “It feels like we’re already in the summer doldrums;” “[We] are moving into summer trading;” “We are in a summer period.” From three different analysts, three identical conclusions- summer has arrived. Granted, summer officially began on June 21, but given all that’s transpired since last summer, I think we can excuse investors from delaying their summer vacations this time around by a few weeks, until the kickoff of second quarter earnings season. Summer usually means a couple things for the financial markets: less liquidity/volume and less fluctuations. The decline in volume is largely self-explanatory, due to what can best be summarized as more play and less work. The decline in volatility is due to a different, but related cause, which is a delay in important investment decisions until the fall, when traders return to their desks and resume monitoring the markets full-time. Both phenomena tend to cause asset prices to move sideways. 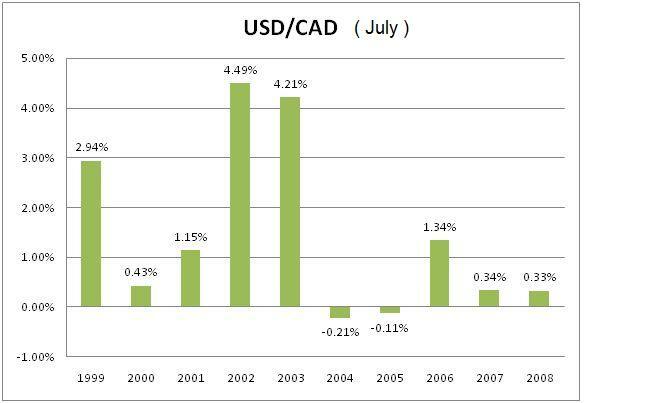 Kathy Lien, of Forex 360, has observed another summer trend: “Over the past 10 years, the Canadian, Australian and New Zealand dollars have seen their steepest slides in the month of July. In addition, we have seen the U.S. dollar outperform the Canadian and New Zealand dollars 8 out of the past 10 years during this month.” This could be a byproduct of delayed allocation, as investors shift capital out of risky markets/positions/currencies. The lesson might be to stick to the majors. Based on all current indications, this summer will be no exception to this rule. While investors have certainly grown more complacent about risk over the last few months, there is a lingering uncertainty. “Economic data at this point ‘can be spun either way,’ likely leaving currency markets next week to key off of any earnings surprises from U.S. companies.” Even with across-the-board positive earnings results, investors will likely remain wary and could hold off on taking any risky (overseas) positions until the fall. Since touching a low in March, the emerging market class has risen by 50%, according to one measure. This led to concerns that another bubble was forming, a swift pullback ensued. The bulls, however, point out that valuations remain well below 2007-2008 bubble levels and that according to some measures, fundamentals are actually quite strong. Accordingly, it could be argued that the recent rally in emerging markets could represent a “reverse correction”- an acknowledgment that the record decline was simply an overreaction. While stocks still remain well below their record highs, bonds are rapidly approaching pre-crisis levels. The spread between the JP Morgan EMBI+ index and US Treasury securities is now approximately where it was one year ago. The best way to account for this schism between capital inflows and economic uncertainty is a shift in the way emerging market investors view risk. Previously, it was default risk that predominated. Now, however, it is inflation and currency risk, as well as corporate credit risk, that guides investor thinking. Over the last few weeks, the stock market rally has fizzled and commodities prices have cooled off. It’s not clear what triggered this sudden surge in introspection (I would call it reasonableness). Regardless, the markets are now wondering out loud whether the optimism of the second quarter wasn’t a bit naive. 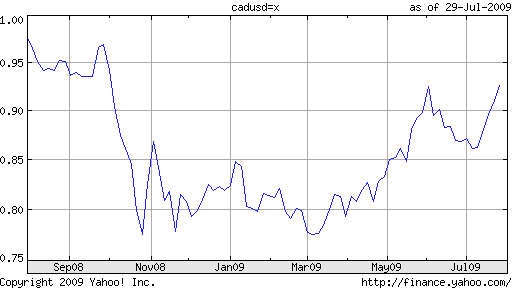 This pickup in risk aversion is also manifesting itself in forex markets, via the upturns in both the US Dollar and Japanese Yen: “The prospect of a slow and bumpy recovery remained the overriding driver of market sentiment and the dollar was soon reasserting itself as the currency of choice – apart from the yen.” Ironically, negative economic data that applies directly to the US is benefiting the Dollar, which goes a long way towards explaining the current market orientation. Currency traders have yet to turn towards comparative growth differentials (despite the predictions of some analysts) and remain firmly focused on risk. Meanwhile, “The yen rally has extended, driven by the liquidation of long-risk asset positions.” In other words, the carry trade has come under pressure as investors move back into low-risk government bonds. The “uncertainty” narrative will likely continue to drive the markets for the near-term, as neither the optimists nor the pessimists have the data to support their respective positions. In all likelihood, the markets will trend sideways and safe haven currencies will see a slight inflow, until there is confirmation that the economy is firmly on the path to recovery. The debate over US inflation continues to be waged- in academic circles, among economists, and in the financial markets. There is no still no clear consensus as to the likelihood that the inflation will flare up at some point, as a result of the Fed’s easy monetary policy and the government’s record budget deficits. While the unprecedented nature of this crisis means that such a debate is still a matter of theory, that hasn’t stopped both sides from weighing in, often vehemently. Admittedly, the risk of inflation in the short-term is still low: “With so much of the world ensnared by the economic downturn, demand for goods and services is weak, which tends to push down prices. Amid high unemployment, workers are in no position to demand wage increases.” Still, the Consumer Price Index (CPI) is already creeping up. The Fed’s “core” measure, which excludes food and energy prices, rose 1.8% from a year ago. If commodity prices continue to rise, the total CPI could soon become positive. (It currently stands at -1.3%). Among academics and economists, the discussion is being framed relative to the Fed; specifically, can it – and more importantly, will it – move to unwind its quantitative easing program when the time comes? 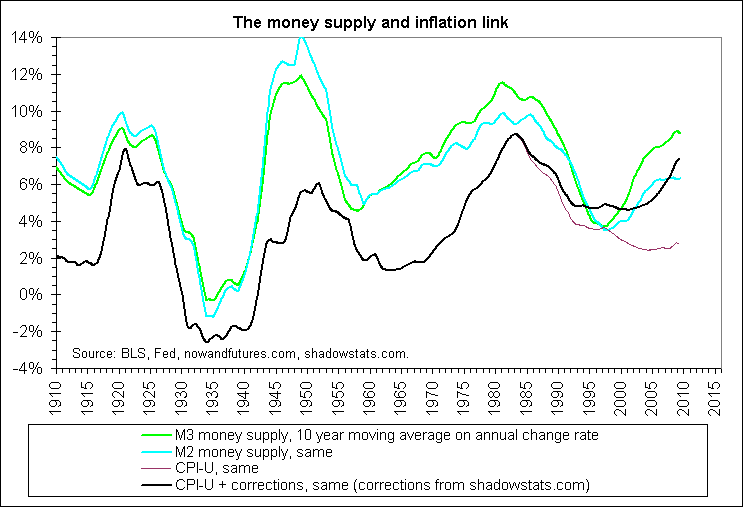 “If it acts prematurely to reduce the money supply, the Fed could stifle the recovery. If it waits too long, it could contribute to a jump in inflation. Its timing is going to have to be perfect,” says a former Fed economist. “Of the $2.1 trillion that the Fed is injecting into the financial system, more than half, or 51 cents per dollar, is being posted back at the central bank by financial institutions in the form of excess reserves, a record high.” In other words, most of the Fed’s cash is not actually finding its way to consumers. Financial markets are equally ambivalent, although erring on the side of caution. Treasury yields on the long end of the curve have risen over the last few months, though this can be attributable to several causes. More specifically, “The spread been nominal 10-year Treasury yields and comparable-maturity TIPS yields has increased from approximately 0.25% at the start of the year to 1.65% currently, reflecting a 1.4% increase in expected CPI inflation over the next decade.” Based on this, it’s clear that while investors don’t share the doomsday pessimism of inflation hawks, they are nonetheless growing increasingly concerned. As part of our ongoing series, printed below is an interview with Sean Hyman, of World Currency Watch. [Blog found here]. Sean has collected over 15 years of experience as a stockbroker, manager, and trader, working for enterprises as varied as a technical analysis “call in” line for their million dollar+ clients and active traders, Charles Schwab, and FXCM. Over this period, he has refined his trading approach through the use of fundamental/technical analysis and intermarket analysis, and now takes a very “macro” approach. Most of the recent discussion surrounding foreign exchange reserves has focused on the allocation of those reserves; specifically, whether or not these reserves will be invested in Dollar-denominated assets to the same extent as before. But what if this discussion fails to see the forest through the trees? In other words, this issue is built on the implicit premise that Central Banks will continue to build their forex reserves, and hence they need a place to invest them. With this post, I will examine whether this is indeed the case. Since the start of the credit crisis, forex reserve growth has slowed as Central Banks (mainly in emerging markets) began to deploy some of their cash: “In the first quarter of 2009, foreign reserves were at 80% of their June 2008 levels in Korea and India, around 75% in Poland and 65% in Russia.” Most of the spending was used for direct intervention in currency markets and to finance capital outflows, as risk-averse investors moved funds out of emerging markets. 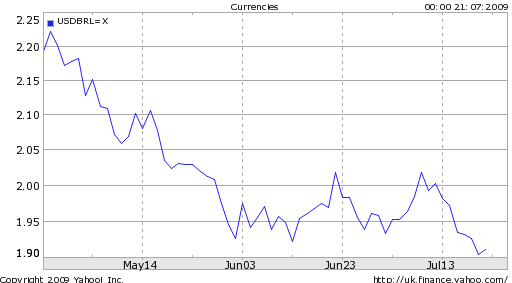 Russia, alone, spent nearly $200 Billion trying to prevent a complete collapse in confidence in the Ruble. 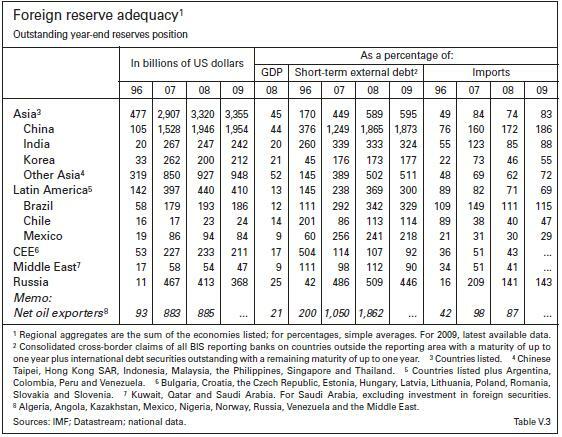 Thanks to their prudence following the 1997 Southeast Asian economic crisis, however, reserves are still more than adequate based on most measures: “A well known rule of thumb (the so-called Guidotti-Greenspan rule) is that foreign reserves should cover 100% of external debt coming due within one year. In 2008, almost all EMEs far exceeded this threshold – coverage was more than 400% in Asia and Russia and around 300% in Latin America. Another rule of thumb, that foreign reserves should cover three to six months of imports (ie 25–50% of annual imports) was also typically exceeded at the end of 2008.” Even despite the recent declines, coverage remains strong enough to meet financing requirements for the immediate future. China, whose cache of forex is by far the world’s largest, boasts a coverage ratio of nearly 2,000%! 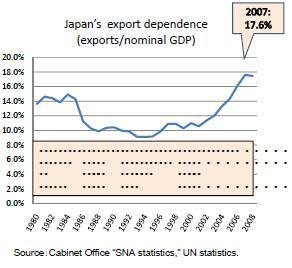 Given such robustness, it’s clear that the impetus to continue accumulating reserves has eroded slightly. Central Banks have also come to realize how vulnerable they are to credit and currency risk, vis-a-vis the allocation of their reserves, which means that the best alternative going forward is probably to start investing in commodities and/or domestic economic initiatives. China has already begun to move in this direction. There are several alternatives that are less risky/expensive than directly holding foreign exchange reserves. “First, in October 2008 four EME central banks each entered into a $30 billion reciprocal currency arrangement with the US Federal Reserve. Second, a $120 billion multilateral facility, drawing on international reserves, was recently established in East Asia…Third, recent G20 initiatives have called for large increases in resources for international financial institutions…[such as the] IMF’s recently created Flexible Credit Line.” Such programs provide countries in crisis with the cash to draw from without forcing them to build up reserves in advance. Will the Euro Survive the Credit Crisis? The Euro has always had a marginal group of naysayers; there were always those who insisted that a common currency didn’t make sense for a region as diverse as the EU. As a result of the credit crisis, a bevy of critics have come out of the woodwork and declared that the Euro will not survive its first official crisis. Are they right? According to a Special Report on the Euro Area published in the Economist (which inspired this post), the Euro has been a modest success by most measures. “The ECB has fulfilled its remit to maintain the purchasing power of the euro. Since the currency’s creation the average inflation rate in the euro area has been just over 2%. Fears that the euro would be a “soft” currency have proved unfounded. It is unquestioningly accepted at home and widely used beyond the euro area’s borders.” While the Euro hasn’t facilitated meaningful gains in productivity or GDP, it has unquestionably engendered greater stability. A country with an independent monetary authority would normally deal with these problems by raising interest rates and/or devaluing the currency. Actually, given how extreme the imbalances are in some of these countries, the markets probably would have accomplished this for them. In this case, however, their membership in the EU and their deference of monetary power to the European Central Bank precludes such possibilities. As a result, the main solutions will have to be originate in the political arena. Wages will have to become more flexible, and labor market controls will have to be loosened, in order to increase productivity. The alternative – leaving the Euro zone- is unthinkable. “The costs of backing out of the euro are hard to calculate but would certainly be heavy. The mere whiff of devaluation would cause a bank run: people would scramble to deposit their euros with foreign banks to avoid forced conversion to the new, weaker currency. Bondholders would shun the debt of the departing country, and funding of budget deficits and maturing debt would be suspended.” As a result, borrowing costs would increase drastically, which could induce a wage-price spiral. Inflation and currency stability would be tenuous, at best. As a result, it’s not surprising that in most Euro member states, polled citizens remain strongly in favor of the Euro. In addition, those on the cusp of joining remain firmly committed to doing so. 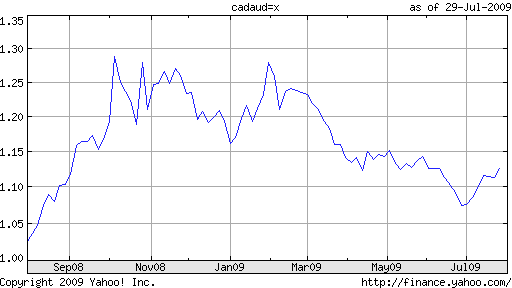 For such economies, the economic crisis has actually strengthened the case for Euro membership. “As emerging economies they are prone to sudden shifts in foreign-investor sentiment, which makes for volatile currencies, so exchange-rate stability holds considerable appeal for them.” Romania and several baltic states have already had to go hat-in-hands to the EU and IMF to ask for assistance in order to stave off a complete loss of investor confidence. Poland is also vulnerable to currency decline, since many of its loans are denominated in foreign currency; it is currently aiming for Euro membership in 2012. There is also activity closer to home. “The government said on April 8 that it will allow Shanghai and four cities in the southern Guangdong province, including Shenzhen and Guangzhou, to settle international trade in yuan.” An agreement with Hong Kong, meanwhile, aims to settle at least half of bilateral trade in Yuan. “Hong Kong Financial Secretary John Tsang said the city will be a ‘testing ground’ for use of the yuan outside mainland China.” If successful, this program could quickly expand to encompass the rest of East Asia ex-Japan.